The 48-Port Gigabit Switch TL-SG1048 is designed to meet the needs of the most demanding workgroup and departmental connectivity requirements. A reliable, easy-to-use switch without the complexity of management, the TL-SG1048 provides 48 10/100/1000Mbps ports. The TL-SG1048 combines ease of use with unsurpassed performance resulting in an exceptional value for any cost-conscious network administrator who wants the best possible solution at the best possible price. 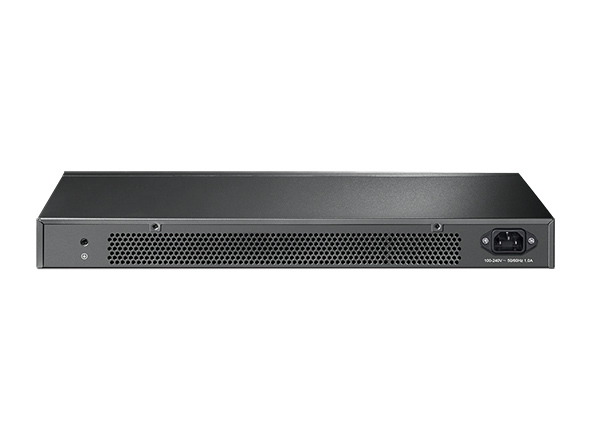 This new generation The 48-Port Gigabit Rackmount Switch TL-SG1048 features the latest innovative energy-efficient technologies that can greatly expand your network capacity with much less power. It automatically adjusts power consumption according to the link status to limit the carbon footprint of your network. It also complies with the EU'S RoHS, prohibiting the use of certain hazardous materials. Besides, 80% of the packaging material can be recycled. The TL-SG1048 features non-blocking wire-speed architecture with a 96Gbps switching capacity for maximum data throughput. An 8K MAC address table provides scalability for even the largest networks. It also supports 802.3x Flow Control for full-duplex mode, and back pressure flow control for half-duplex mode alleviates traffic congestion and ensures reliable data transmission.